Buy 1 Get 1 Holiday Drinks at Starbucks! | ...and another cup of coffee. Buy 1 Get 1 Holiday Drinks at Starbucks! Yes! 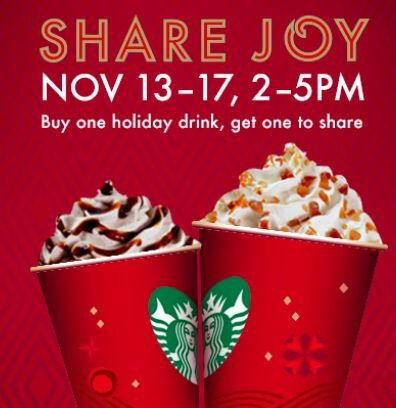 Starbucks is offering Buy One, Get One Free Holiday Drinks from 2 to 5 p.m. November 13 through 17, 2013.